Most kids like to draw, or maybe they call it fooling around with a pencil or paintbrush. By encouraging our kids to experiment with digital drawing, we’re providing them with an opportunity to create something, an activity I believe is worthwhile and educational. Drawing on an iPad should NOT take the place of real life drawing and play. Rather, to me it’s just another tool we can use with kids. Like ebooks and print books, there will be times that drawing and creating on an iPad will appeal to certain children at certain times. As parents and teachers we should never forget that children NEED physical play, they need the sensory pleasure of spreading paint or decorating with glue. Recently I wrote an article for Scholastic Parents Learning Toolkit blog, where I mentioned my favourite iPad apps that kids, teens and adults can use for drawing. I’ve tried many other drawing apps but they are certainly not on my favourite list of apps to use with kids. I don’t like apps that demand you buy more tools, or ones that are “buggy”. I look for ease of navigation, but not long manuals or steep learning curves. Value for money is important to me, as are privacy concerns. 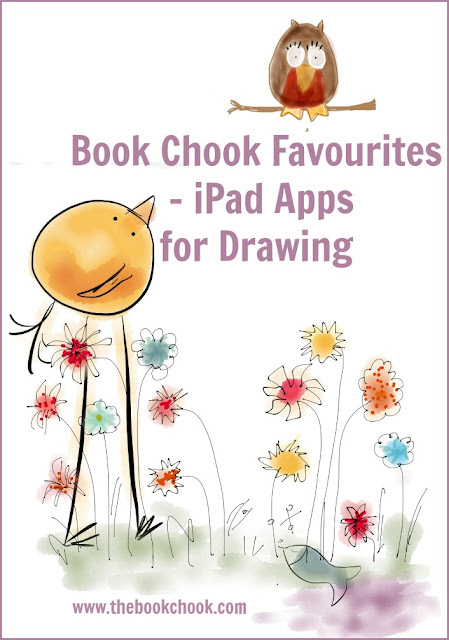 The ones I mention in the Listly list below may not be perfect but they have the coveted Book Chook Feather of Approval.